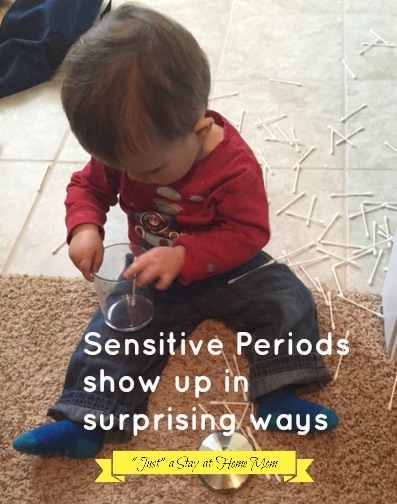 Archive by Category "Montessori at home"
This morning my son demonstrated what Montessori calls a “Sensitive Period”. I have been learning about Montessori principles over the past three years, thanks to Age of Montessori (based in my hometown of Bozeman). I completed their 9-month online teacher training course (but I audited it, since I wasn’t planning to become a certified teacher). That experience gave me the chance to gain the knowledge and tools of Montessori education, enough to use Montessori in-the-home while I am a SAHM for the first 3-5 years of my son’s life. Well, today, he was particularly interested in doing that with the cue tips. Now, if I wasn’t educated about Montessori’s Sensitive Periods, I would probably have been annoyed and told him he was being naughty for making a mess. Thankfully, a story from Mary Ellen Maunz was echoing in my head. One day a little girl was pouring out her mother’s hair pins in the bathroom. The mother decided that instead of reprimanding her, she would carefully watch to see what happened next. To her surprise, the young child repeatedly carefully picked up and put each hair pin back into it’s container. When she was done she poured all the hair pins out and repeated the steps to refill. This mother understood sensitive periods. Maria Montessori noticed that children seem to have stages in their development where they are intensely interested in a repetitious activity/behavior and that is a sign that they are in a “sensitive period” to be developing in some way. In this case, my son is in a developmental period where his brain is thirsty for chances to practice emptying and refilling containers. I’m not sure if it is the coordination it takes to get the items in the container, but something about the activity is extremely satisfying for him, and that means he is meeting an internal developmental need. The focus he has and the enjoyment on his face, while putting in cue tip after cue tip, shows me that he is in a sensitive period for this type of activity. So, I am striving to find as many opportunities as possible to give him items to practice with. He can do this with the cue tips, the makeup in my morning make-up bag, the blocks in an yogurt tub, etc. When he has met the internal developmental need to master this task, he won’t be interested anymore. So, I don’t have to focus on this activity forever. But, if I can be mindful and attentive enough to my child, I can catch these sensitive periods and try my best to encourage them. Learn more about Age of Montessori’s Teacher Training Program here.